A forgotten name in watchmaking who was once the partner of Patek, Czapek & Cie. has just been resurrected via crowdfunding, with its first wristwatch being a seven day power reserve watch. 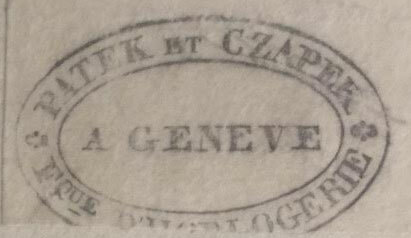 Franciszek Czapek, or more appropriately for Swiss watchmaking François Czapek, was Pole who moved to Geneva in the early 19th century. 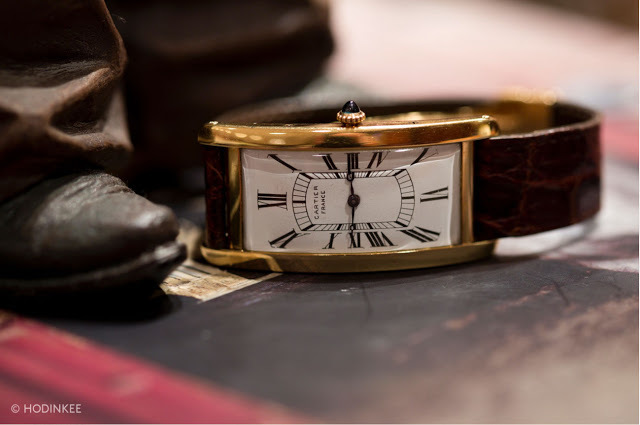 He is best known for establishing Patek, Czapek & Cie. in 1839 with fellow Pole Antoine Norbert de Patek. 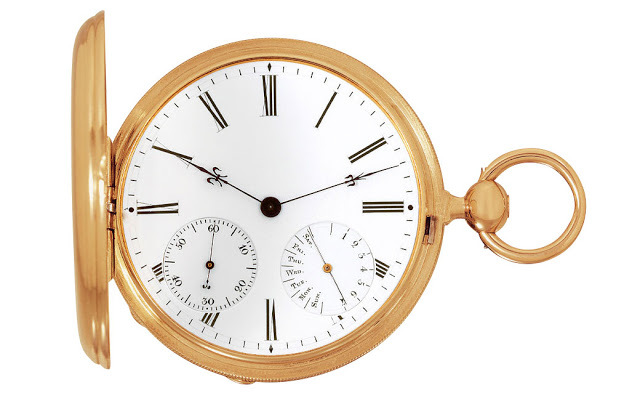 Czapek and Patek separated in 1845, with Czapek finding success on his own, becoming clockmaker to Napoleon III. His former partner, however, would ascend into legend as one of the founders of Patek Philippe along with Jean Adrien Philippe. 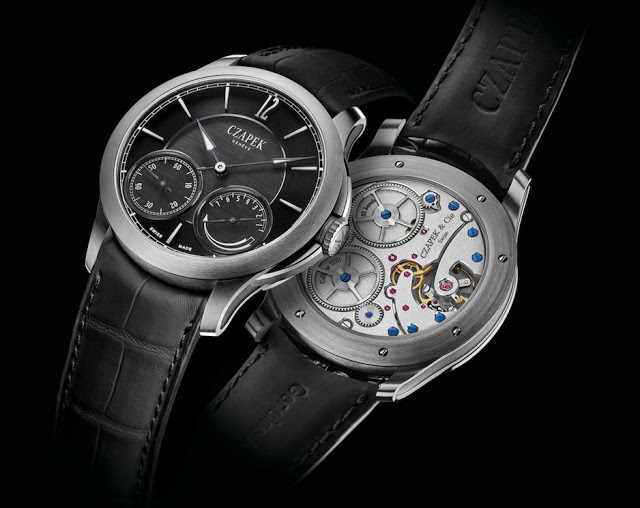 Czapek, on the other hand, was eventually forgotten, until now. 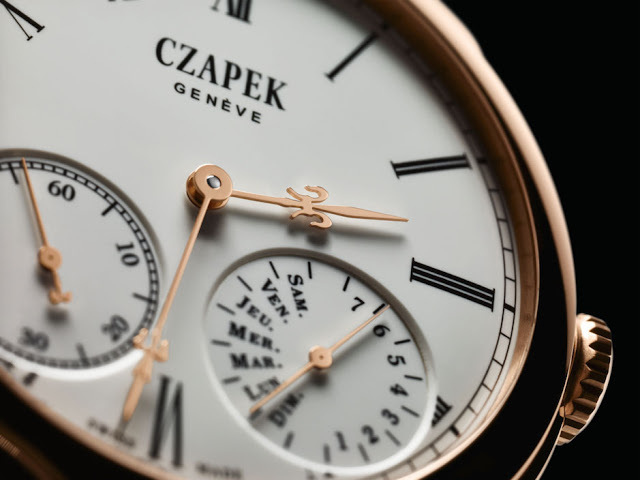 Czapek & Cie. has been revived by three Swiss entrepreneurs who are banking on Raizers, a French crowdfunding website similar to Kickstarter, to raise SFr1 million to finance the revived company. The trio had already accumulated some SFr500,000 through selling a small run of chronograph wristwatches powered by a basic, new old stock Valjoux 7733 chronograph calibre from the 1970s. With that money Czapek & Cie. conceived the Quai des Bergues, named after the street in Geneva that runs alongside the Rhone river. Best known for the Four Seasons hotel that sits along it, Quai des Bergues was where Czapek had his workshop in the 19th century. An ambitious project given the tepid state of the watch industry, the Quai des Bergues wristwatch is hand-wound with a seven day power reserve, featuring a sub-seconds as well as a power reserve indicator that doubles as a day of the week display. It’s powered by a movement designed and made by Chronode, the movement specialist run by Jean-Francois Mojon, better known for calibres in high-profile watches like the MB&F LM2 and HYT H1. 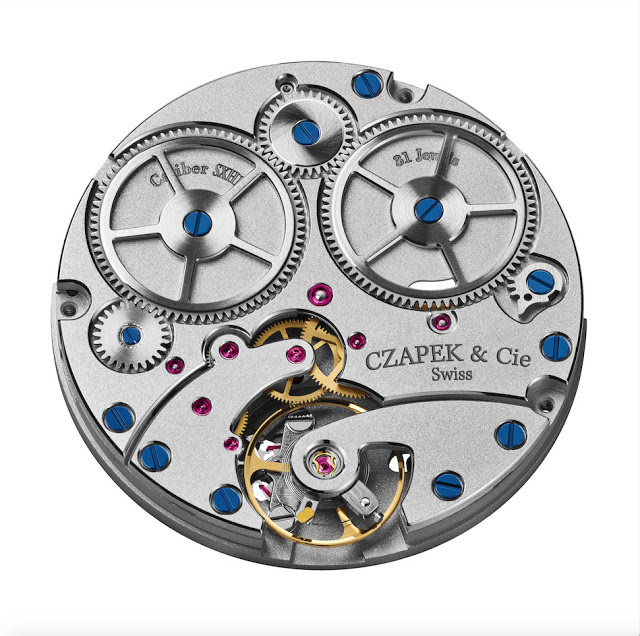 Named the SXH1, the movement is loosely inspired by an 1850 pocket watch made by Czapek. It has a frosted finish on the bridges, along with blued steel screws. 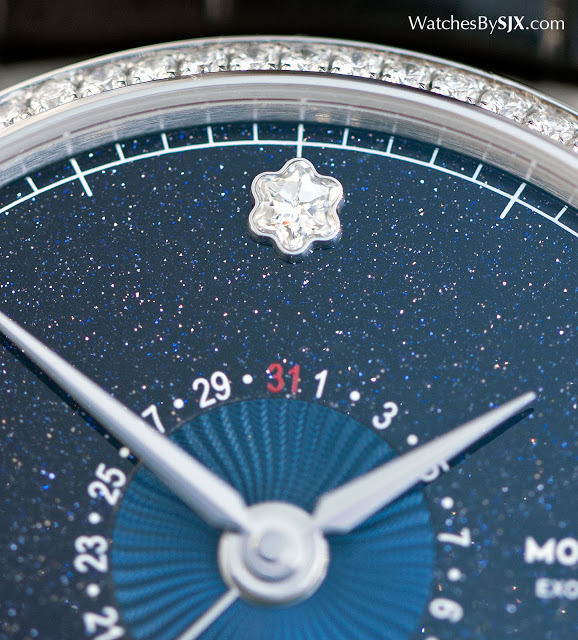 The movement is loosely based on the C501 alarm movement that Chronode supplies to Harry Winston. Beyond Chronode, Czapek & Cie. is relying on other respected names for the rest of the constituent parts of the watch, including Les Artisans Boîtiers, the case maker that’s part of Parmigiani Fleurier, and dial specialist Donzé Cadran, well reputed for its enamel dials. The Quai des Bergues has a 42.5mm case, with several different versions on offer. The rose and white gold models are fitted with a fired enamel dial, along with the option of lance-shaped or fleur-de-lys hands. It’s also available in titanium with a diamond-like carbon (DLC) coating, or “XO” steel, an alloy never before used in watches that’s corrosion resistant. 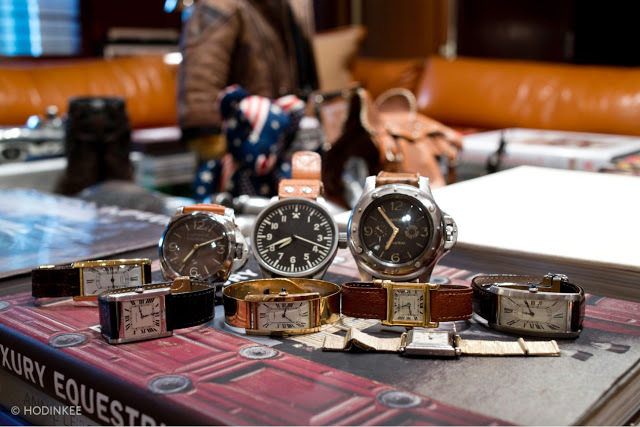 Pricing The Quai des Bergues wristwatch starts at €9950 in steel, while the titanium model is priced at €14,900. In rose gold it starts at €24,300 and in white gold, €24,900. Bryan Ferry Designs Wristwatch For H. Moser & Cie.
Hajime Asaoka is a Japanese independent watchmaker who only recently began making timepieces. Entirely self-taught, he works out of a converted apartment in Tokyo which is equipped to make nearly all of the components required for his timepieces. Montblanc gives a bit of flash to the Heritage Chronométrie ExoTourbillon Minute Chronograph with the new Vasco da Gama limited edition set with diamonds. In the world of tourbillon chronographs the Montblanc Heritage Chronométrie ExoTourbillon Minute Chronograph is the most affordable yet. 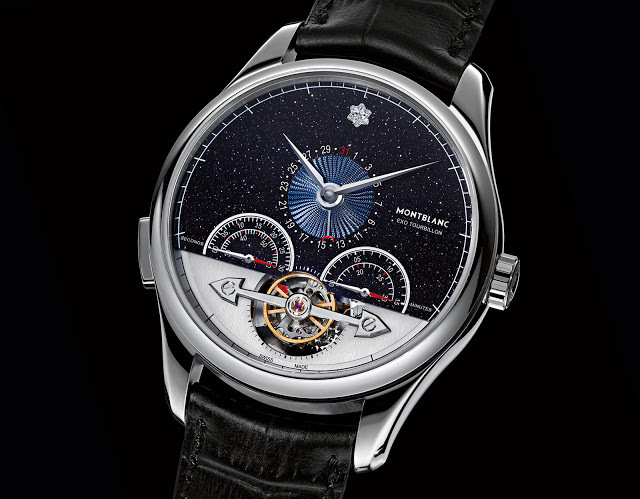 Unusual for its unique tourbillon that separates the cage and the balance wheel, it still costs €39,500 for the basic model, but that’s half as much as the competition. At the recent Watches&Wonders 2015 fair in Hong Kong Montblanc debuted the jazzed-up version of the Heritage Chronométrie tourbillon chronograph, a 25-piece limited edition set with diamonds dedicated to Vasco da Gama. The Heritage Chronométrie ExoTourbillon Minute Chronograph is based on the self-winding chronograph movement found in the Nicolas Rieussec chronographs, one of the brand’s signature timepieces. It retains the same twin chronograph registers, but with hands instead of the discs that distinguish the Rieussec chronographs. The seconds are on the left counter while the minutes are at right. The unique, dispossessed tourbillon What makes the Heritage Chronométrie ExoTourbillon Minute Chronograph unusual is its tourbillon regulator, one that’s constructed totally differently from conventional tourbillons. 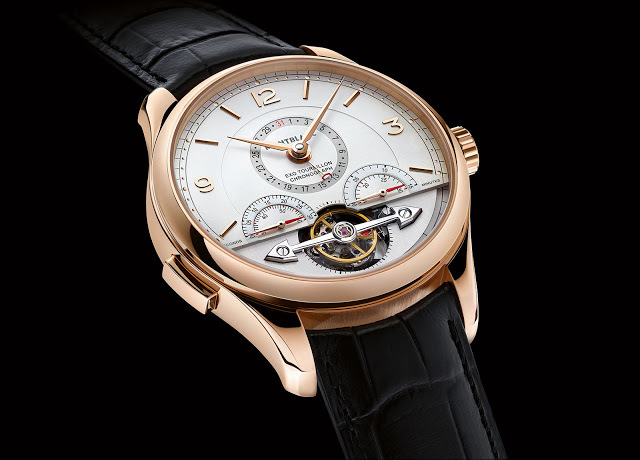 Named the ExoTourbillon, the regulator was originally conceived for the pricey Villeret 1858 timepieces, including the €250,000 ExoTourbillon Rattrapante. 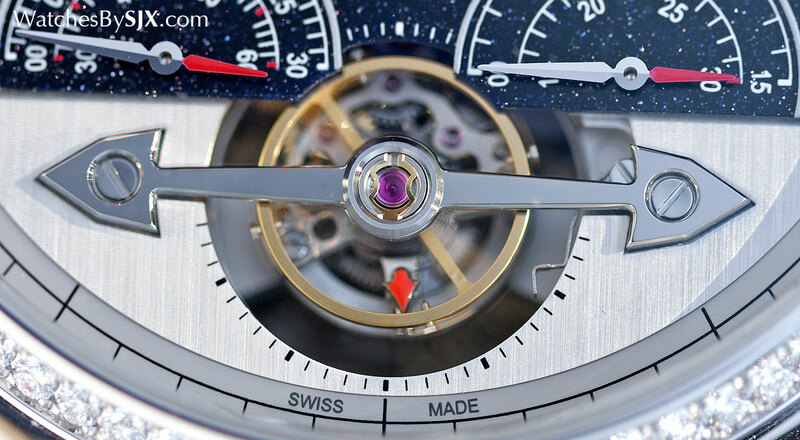 Ordinary tourbillons have the balance inside a rotating cage, the ExoTourbillon separates the two, with the cage sitting below the balance wheel. That construction means that the cage can be smaller, requiring less energy to turn, making the movement more efficient. And it also means the balance wheel can be larger, giving it greater inertia and stability. 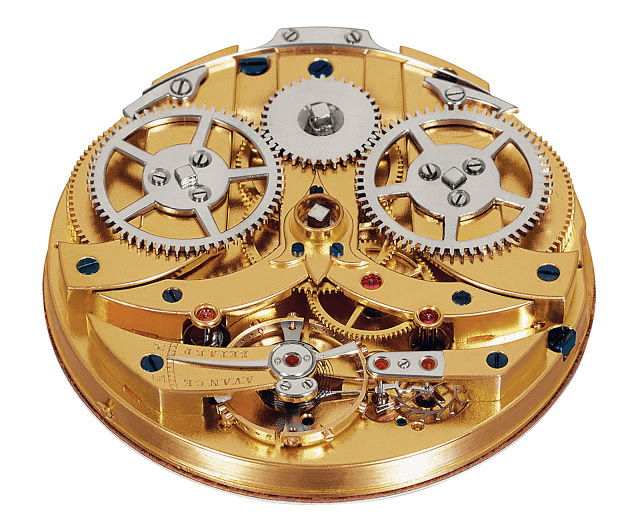 Another unusual feature is the stop-seconds mechanism: a tiny lever presses against the balance wheel when the crown is pulled, stopping the balance and the seconds hand for more precise time-setting. Time-setting is also made more convenient with the independent adjustable hour hand that can be set in one hour increments when crossing timezones. Setting the hour hand does not affect the synchronisation of the minute and seconds, ensuring their accuracy. The twinkling night sky The limited edition Vasco da Gama tourbillon chronograph is fitted with a dial made of aventurine, a quartz crystal with tiny, sparkling mineral inclusions, giving the dial the look of the night sky. 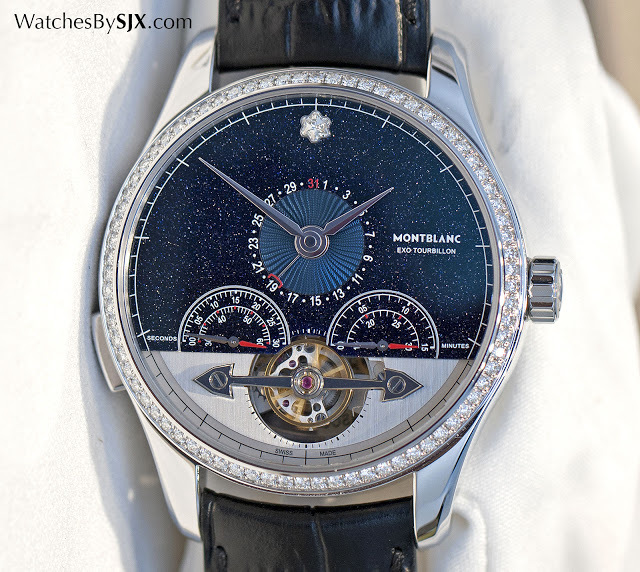 A diamond shaped like the Montblanc logo – its cut is a Montblanc patent – is the 12 o’clock marker, while just below the date is indicated on a small sub-dial finished with a radial wave guilloche. 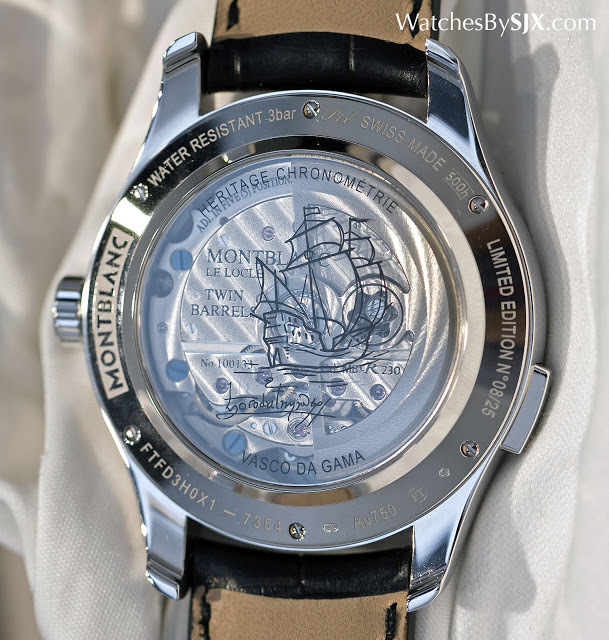 On the back, the sapphire crystal is printed with a stylised rendering of the São Gabriel, the flagship of Vasco da Gama, the 15th century Portuguese explorer Montblanc has adopted as an emblem. 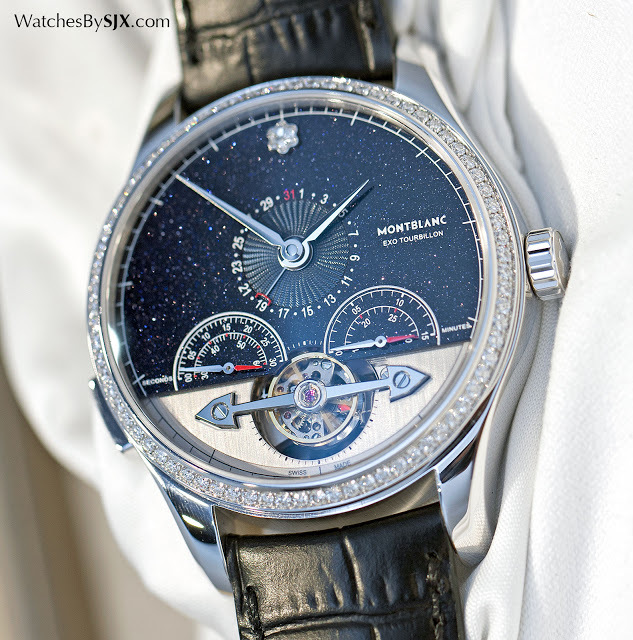 That’s a nod to the spirit of exploration, and also a catchy appellation for its timepieces. The movement decoration is adequate for the price point. As expected, it is all mechanically applied, but nonetheless good enough to be visually appealing. 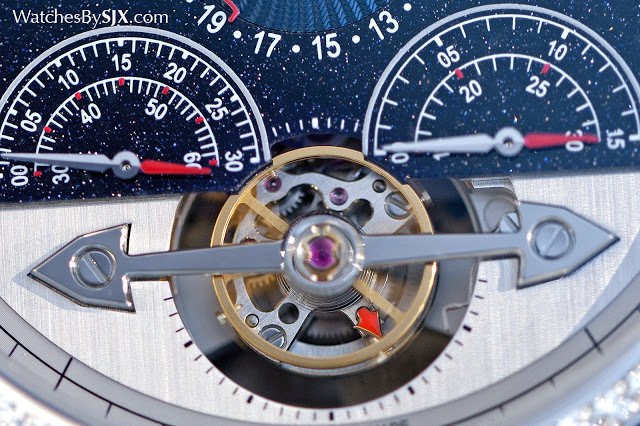 The arrow-shaped tourbillon bridge for instance has bevelled edges as well as countersinks for the screws and jewel. The case is the same 44mm style for all editions of the Heritage Chronométrie ExoTourbillon Minute Chronograph. It’s large, but not overly so by modern standards. Both limited edition models are in white gold, while the regular production model is in rose gold. Pricing and variants The Heritage Chronométrie ExoTourbillon Minute Chronograph Vasco da Gama Diamonds Limited Edition 25 shown above is priced at € 52,500 (or S$83,100 in Singapore). The version without diamonds is limited to 60 pieces, priced at €48,000 (or S$71,200). And the regular production model in rose gold is priced at €39,500 (or S$60,200).